Much of the fitness industry is built around pre-workout supplements, but what are they and how do they work? These are questions you might have if you’re new to pre-workout supplements. Sadly, there’s some unscrupulous business out there so educating yourself on these products is crucial. Today we’re going to guide you through this bewildering market to figure out what you want, what you should avoid, and how to objectively analyze products on the market. By the end of this article, you’ll be equipped with a discerning eye for what makes a great pre-workout supplement and how to pick the one that suits you best. Caffeine is the single most common and important part of a pre-workout supplement. This is because caffeine causes changes in your body that help you have a great workout. The first is focus and wakefulness – something you’ll be familiar with if you’ve ever woken up at 5am to get a workout. A cup of coffee or pre-workout can make the difference between feeling awake and simply going through the motions. If you’re training for the best results, being aware and in the moment is key to performing well in the gym. Secondly, caffeine actually improves performance in some physical characteristics as well as mental ones. For example, it’s been associated with improved strength and power in exercise when consumed by tired people. For your workout, this means that proper caffeine dosing and quality mean more weight lifted, faster sprints, or simply moving better in your chosen exercise. This all works because Caffeine increases adrenaline, frees up fatty acids for metabolism, and improves neural processes. These all tie into a better workout and they’re the reason that pre-workout and energy drinks (which provide a relatively low dose) are popular. The problem with Caffeine, as with anything else, is in the dosing. Caffeine is very healthy in small doses when taken at the start of the day and when used to improve responses but taking too much comes with side-effects and negative responses. The dose you want for performance is going to depend on your own tolerance – the result of age, weight, and how much you’ve had in the past – but around 250-500mg is what we see in all the studies that show big results. 400mg is the best dose for those who are healthy and do not have any existing heart issues but build up slowly to make sure you don’t experience side-effects. Caffeine has a strong impact for 30-60 minutes but remains in the body for another 4-6 hours. Be careful to avoid overlap and make sure that you’re timing your caffeine to be around 30 minutes before the really tough part of your workout where possible. Supplements that contain more than 250mg should not be used by anyone who doesn’t take caffeine regularly. Start small and work your way up based on what you feel is healthy and safe for you. Caffeine is generally very safe, but if you’ve got previous medical conditions or you’re not a regular user, it is worth slowly easing your way into it or contacting your medical professional to make sure it’s going to be safe. Some people simply cannot consume caffeine – whether through intolerance or a heart condition – and alternatives are a big question when it comes to pre-workouts. To start with, there’s no true 1-1 alternative. This simply means that you’re not going to find a direct alternative to caffeine and, if you’re concerned because of a medical problem, all stimulants are off the table. We’ve done a whole guide for stimulant-free and caffeine-free pre-workout supplements which makes this a non-issue! Theanine is an effective way to improve your focus and performance, but primarily when combined with caffeine. It provides some benefits by itself, but with a much smaller effect than stimulants like caffeine or synephrine. Other alternatives to caffeine can include vitamins and minerals that are specifically designed for improved alertness and focus. These include things like B12, but they’re also a big step down from the results you can expect with caffeine. If you’re just bad at processing caffeine or have an allergic response, ask your doctor about using a theobromine supplement. This is a milder substance that competes with caffeine in the body, but it may provide some of the same positive benefits without any of the risks, depending on your personal needs and medical situation. Overall, there’s no real alternative for Caffeine if you’re healthy and worried about performance. While there’s been a lot of scare-mongering around caffeine (primarily to sell “natural” alternatives), it’s a time-tested substance with very few problems. Once you’ve achieved a healthy and effective dose of caffeine or theobromine, the next step is looking at what other benefits a pre-workout brings. There are a small handful of really helpful compounds that you should look for in a good pre-workout supplement. A great but misunderstood ingredient, Creatine is the #1 choice for building up strength, power and strength-endurance. It boosts the efficiency of producing energy in your muscles and allows you to push harder for longer. It also directly boosts muscle-building and recovery, hydration, and boosts cell health. There’s a lot to say about Creatine as it’s very nearly considered a vitamin, but all you need to know for now is that it’s a great ingredient. If you can’t find a pre-workout you like with Creatine, you can always buy it separately as it’s very affordable and comes in powder form. If Creatine is the best for strength and power, beta-alanine is the endurance counter-part. This boosts your overall endurance and time-to-exhaustion, meaning you will be able to run, row or cycle further before getting exhausted and recover more effectively between sets. 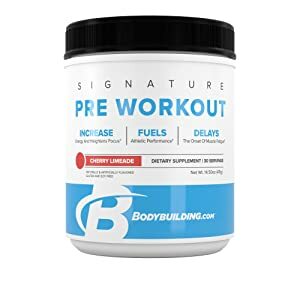 This is another very cheap product, so if you’ve got a specific goal in mind and want to really focus on your endurance, you can get beta-alanine as a powder inexpensively. We’ve got a whole article on citrulline and why it’s great for you, but the long and short of it is that Citrulline brings great “pumps” in the gym and improve your short-term recovery. If you’re looking to boost performance for physique training, this can be a great choice. You’ll want a supplement with around 3g of citrulline if you’re trying to get a great pump and keep your performance balanced across several sets. For health and wellness, vitamins and minerals are essential. However, they also play a key role in performance and alertness. Combining these with caffeine and other active ingredients is a great way to improve your overall performance and recovery. Some products, like Cellucor’s C4 pre-workout supplement, contain doses above 100% of your recommended daily allowance. We strongly recommend this as many compounds don’t absorb very well – like B12. Try and get as many vitamins and minerals as possible, but don’t worry if you’re not getting all of them – you should be getting them in your diet anyway. There are some pre-workout supplements that include carbohydrates to fuel your workout. 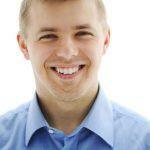 This is a mixed bag: sometimes it is a great choice, but it depends on your needs and schedule. It’s far superior to separate out your pre-workout supplement and pre-workout carbs if possible. It’s a lot easier to pick and choose if they’re not mixed into your supplements! A pre-workout carb-rich meal is a great idea, but carbohydrates before, during, and after a workout do have serious benefits. Either find a pre-workout supplement without carbs and eat your own before working out, or make sure that you’ve got a reliable routine around your workout. Carbs during periods of exercise and energy-use are great for fuel and to maximize muscular recovery, but it’s always better to have choice. For this reason, we recommend avoiding carbs in a pre-workout, though you should have your own pre-workout carbs. There are certain things on the market that don’t really add much benefit but tend to be shoe-horned into pre-workouts for marketing purposes. These aren’t bad, but they’re not worth worrying about when you compare pre-workout supplements. Branch chained amino acids (or BCAAs) are the most common of these. They’re mostly irrelevant if you’re not protein-deficient in your diet – you’ll probably be getting enough of them from food and don’t get any significant benefits from a Pre-workout with BCAAs in. Leucine is an important BCAA for muscle-building, but that’s better off by itself and, even then, you find it in most protein-rich foods. Just make sure you eat a carb- and protein-rich meal after you train. Secondly, Arginine is a common supplement ingredient but is an inferior version of citrulline. It breaks down during digestion, making it very ineffective at boosting your pump or endurance, while citrulline converts into arginine in the body, making it much more effective. Glutamine is the last ingredient that is over-hyped in pre-workouts. While it brings positive effects to those with deficiency or increased needs (such as vegans or those rehabbing after surgery), more than the “sufficient” amount won’t bring any benefits. It can increase insulin a little, but this means that if you’re taking glutamine it should be with your pre- and post-workout meal, not in a pre-workout drink where carbs are likely to be scarce. 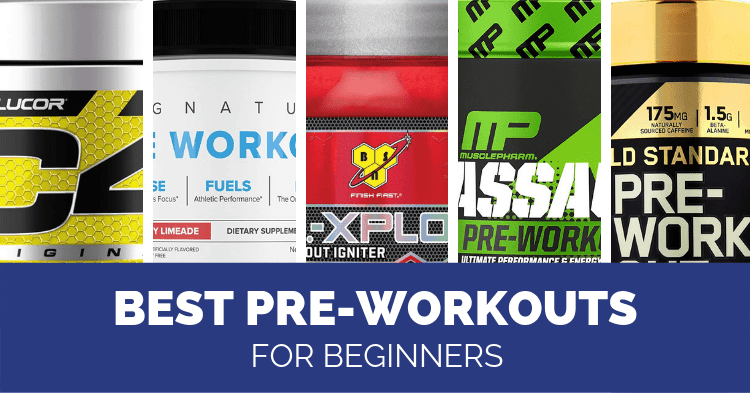 There are a wide variety of pre-workout supplements on the market, but today we’re going to discuss some of the most popular. 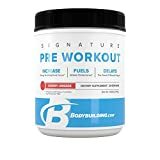 This is a great way to get an idea of how to evaluate a pre-workout supplement, but also provides a way to look through some of the most acclaimed supplements and even make your first purchase! MusclePharm is one of the biggest companies in the supplement market with endorsements by Arnold Schwarzenegger among others. 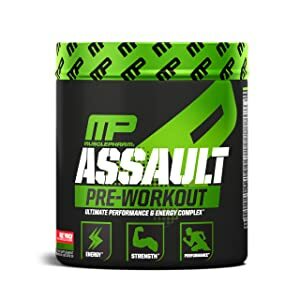 Their “Assault” Pre-workout supplement is a great addition to the market, though it does come with a lot of unnecessary nonsense – but the positives far outweigh this. The caffeine content is hidden in a proprietary blend, so we can’t even figure out how much is in there, but it comes combined with Huperzine-A and Choline which are both great at boosting cognitive performance and explosive power output. This is a great combination for serious athletic performance. The ATP amplifier and “ion-3” blend are less promising. Ingredients like creatine and beta-alanine are present, as well as beneficial compounds like beet extract, but they also contain mostly-irrelevant things like glutamine and L-Aspartic Acid. We like the variety of ingredients but there’s a mix of fantastic, obscure, and unnecessary in this product. Overall, definitely a great choice for anyone looking to maximize their performance in strength, power and recovery. 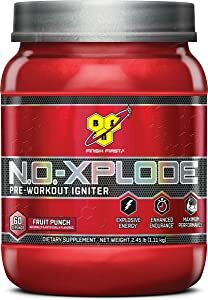 BSN’s N.O.Xplode is another popular pre-workout supplement in the bodybuilding community and the combination of high-dose creatine with other muscle-promoting compounds is a key factor in this. Alongside effective doses of creatine, caffeine, and Citrulline, it provides a wealth of vitamins and electrolytes to make sure you’re fuelled for high-rep exercises. With comparable levels of Huperzine-A and other cognitive-performance compounds (such as Tyrosine) to Assault, it’s looking like a strong competitor. Aside from the creatine content, however, we’re struggling to see what makes N.O.Xplode stand out – it seems comparable to Assault but without some of the better ingredients like Choline. We’re impressed by the product overall but can’t help but feel like it’s missing out on an edge – leaving it in second place. 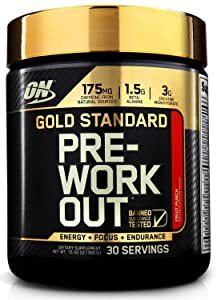 Gold standard pre-workout combines popular ingredients but seems to lack any distinctive selling point when compared to other products on the market. The caffeine dose is much lower than others, such as BSN’s N.O.Xplode and is actually below a scientifically effective dose for strength and power. This is a concern since you don’t want to take multiple servings based on your caffeine tolerance, but this is simply not enough to bring positive physiological changes. The creatine and beta-alanine doses in this product are great and they bring the kind of strength and endurance benefits that we’re looking for – but no more than competitors. This easily out-classes the Bodybuilding.com Signature pre-workout but doesn’t compare to others on this list. Finally, the inclusion of citrulline means that recovery between sets will improve and you can expect a more-intense pump during workouts. Fortunately, the inclusion of tyrosine and carnitine bring some additional benefits, but these are still out-classed by pre-workouts with cholinergic compounds like Huperzine and choline. A classic among athletes and bodybuilders, Cellucor’s C4 pre-workout is one of the most recognizable and acclaimed products. To start with, it packs a well-dosed punch of caffeine, making it a great starter for focus and performance. This is combined with a vitamin and mineral complex providing up to 600% of your daily needs – a great addition and a positive approach to health as well as a great workout. C4 also contains creatine and beta-alanine, two of the most important compounds from the list mentioned above. These two ingredients mean that your strength and endurance are going to see significant boosts over time if using C4 continuously. The use of Arginine is a concern – when citrulline does the same thing but much, much better. Arginine is better than nothing, but this is definitely the biggest problem we’ve got with C4 – it could just be a little better. 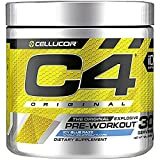 A great pre-workout, C4 Is well-regarded because it does almost everything right with very little useless or extraneous stuff. A great choice and the standard for pre-workouts on this list. Bodybuilding.com have a sketchy corporate history, with examples of spiking their products with steroids to improve sales. We’re hoping that they’ve changed their ways, as the Signature pre-workout is popular in the bodybuilding world. This is definitely a different product to MP’s Assault: the ingredients are aimed towards bodybuilding and are very simply listed. Caffeine is a simple starting point at 200mg per serving, combined with Citrulline for the huge pump and recovery benefits we mentioned above – the first supplement on this list to use the superior nitrogen booster. However, while there’s a healthy dose of beta-alanine in this product, there’s no creatine. This makes no sense since it is a crucial part of any pre-workout for strength and hypertrophy. Almost all other PWO supplements use Creatine, meaning that the Signature pre-workout is already behind. With leucine and a blend of key minerals, this product provides good effects, but the lack of creatine makes it a 3rd place after Assault and C4, respectively. Pre-workout supplements are all very similar in their intended effects and ingredients. However, small differences can make a big change to whether or not a certain product is suitable for you. We’ve outlined a few products and how they compare but, ultimately, it’s about what you want from a pre-workout supplement. If you’re looking for an all-round performance booster then we recommend Assault from MusclePharm. But take a little time and figure out what best suits your needs!